Dan Clarke from Marengo Illinois made up his mind that this was the year he was going to chase after the points in the 2.6 class. Clarke competed in seven sled pulls overall and took 2nd place at both the Georgia and Colorado event. As we headed to the World Finals Clarke held a slim lead over Weylin Richards and since the World Finals is double points Clarke would need to have a great pull to keep the lead in the National points chase. 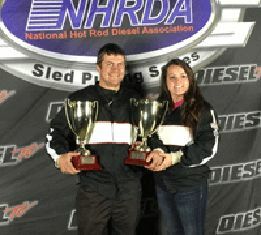 Clarke made a pull of 331.03 at World Finals and Richards went 324.01 hence Dan Clarke won his 1st ever National Championship in the 2.6 Class Congrats to Dan and Dan's Diesel Crew!